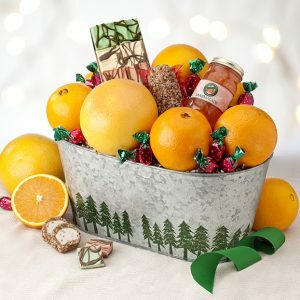 Our genuine planter-style tin container, bordered with evergreen trees, is chock-full of all the good things the holidays have to offer – Navel Oranges, pump Ruby Red Grapefruit, a Florida chocolate assortment, Marmalade and a nougat-filled pecan log. 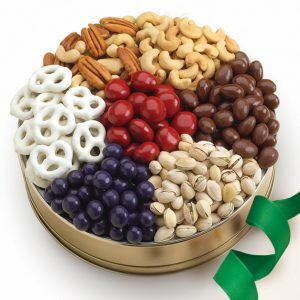 The arrangement is accented with hard fruit candies. 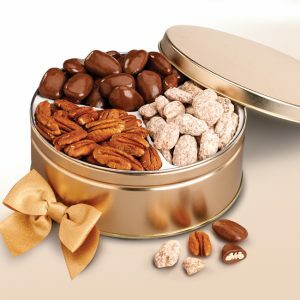 When the goodies are gone, the tin is a wonderful, decorative piece. Such an impressive gift! 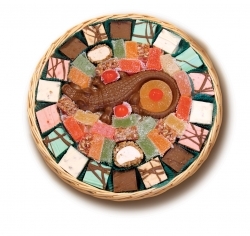 A big ole’ solid chocolate Florida gator relaxes on his island made of citrus juice candies and pecan log roll slices, chocolate candies and fudge slices with pecans, peanuts, coconut, orange, mint and peanut butter flavors.